The German company Iwis produces some of the best chains in the world, including OEM timing chains for Porsche, BMW and Mercedes Benz. Now you can buy the ultimate chain for your Lambretta, suitable for all models with stock 15 tooth front sprocket (All Series 1/2/3 models except for TV Series 1 and GP200). 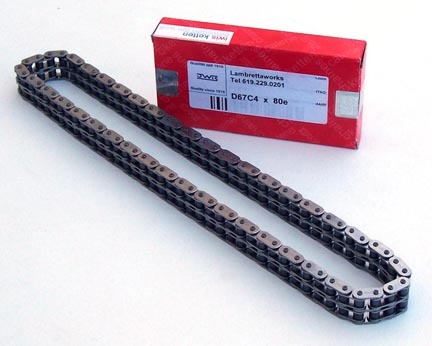 Deliver the power to your transmission with the smoothest running, strongest chain available. Get rid of that shoddy Indian or Spanish chain and go with the best for peace of mind and durability.